So the Duke and Duchess of Cambridge have had a baby boy and named it George Alexander Louis. The name that was expected and, indeed, if you started working out all the possibilities - the only so-called 'royal' name that was really viable. I wanted to see how their royal predecessors' name choice affected the popularity of the name. Are royal names copied? But for the recent generations of royals, the BBC got there first. 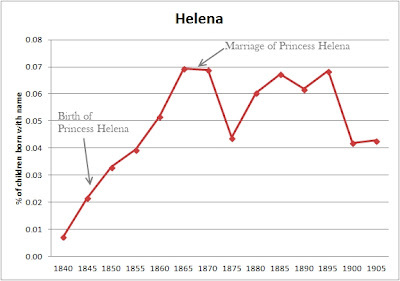 Their graph is perfectly adequate and going from my title, it seems that Queen Elizabeth and Prince Philip were traditionalists, and Prince Charles and Princess Diana were trendsetters. By that, I mean that the names chosen by Elizabeth and Philip were already fairly popular when chosen by them, and did not increase substantially in popularity, despite being given the seal of approval. William and Henry - or Harry - however, grew in popularity following their births. You could say that Charles and Diana tapped into the zeitgeist of the age, or that they did set a trend. To me, it seems clear that baby Prince George has a name that is traditional. It is yet to be seen whether the choice will be a trendsetter - it has risen in rank over the past ten years but decreased in the actual percentage of people who bear the name (see the ONS's Name Comparison tool and Anna Powell-Smith's England and Wales Baby Names visualisation site). If anything, at the moment, the Duke and Duchess of Cambridge seem to be trend-followers rather than trendsetters. So the modern royals are traditionalists and trendsetters. How about Queen Victoria? I'd like to suggest that she was both, and a trailblazer as well. I talk about where my data comes from at the end of the post. The first child, born in 1840, was named Victoria. It was the name that the Queen had chosen as her regnal name (her first name was Alexandrina), and that the Queen's mother, the Duchess of Kent, was known by. As a regnal name, it was a trailblazer - there had never been a Queen Victoria nor any other prominent British royal wearing that name. But as a choice for Queen Victoria's daughter, it was traditional - she named her daughter after herself. 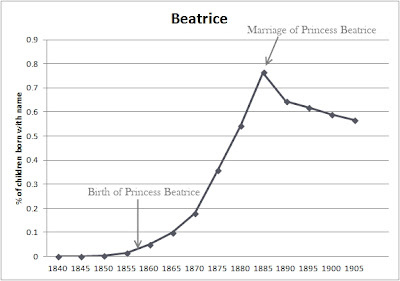 And as this graph shows, the accession of the queen and the birth of her first child barely affected the name's popularity. 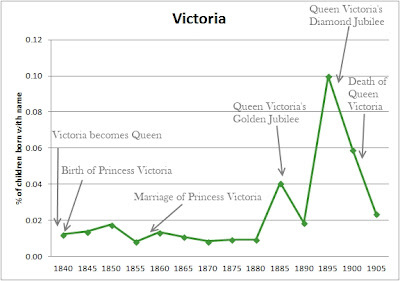 Granted, I don't have any data from pre-1840, but suffice to say that the number of Victorias was negligible throughout the Queen's reigns, at least until her Jubilees. Her own name set no trends. Louise was Victoria and Albert's sixth child, born in 1848. 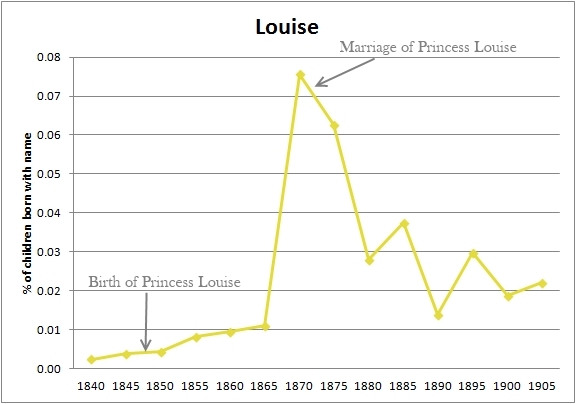 Her birth had little effect upon the popularity of the name, indeed the big spike in its popularity came in the 1870s - when Louise married a subject, the Marquess of Argyll. 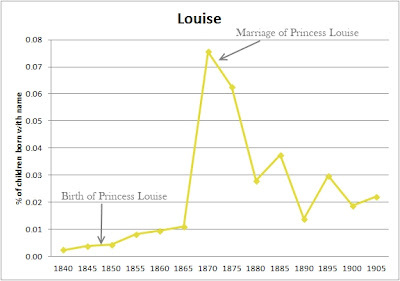 Previous royal marriages with European royals had proved unpopular, when Louise married for love, it seems to have prompted a spike in the popularity of her name. Louise was a traditional choice - it was the name of Albert's mother. However, Albert's parents had separated, and it is possible that Victoria chose it because it was the name of her beloved tutor, Louise Lehzen, who had been supplanted by her husband. The name had also been borne by various European royals including Louise of Denmark who, by the 1860s, would be the Danish Queen and Edward VII's mother-in-law. More notably, it had been borne by a daughter of George II who had become Queen of Denmark and as Louisa, by a sister of George III. With the exception of Louise, Victoria and Albert had assiduously avoided any names borne by previous Hanoverian princes and princesses, and it may be why Louise didn't get copied by the public immediately. Leopold was Victoria's eighth child, born in 1853. 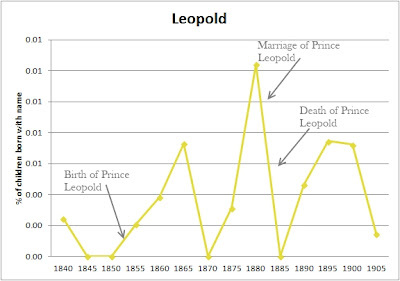 The above graph may look like the birth of Prince Leopold had an effect on the name's popularity, until you look at the scale. It doesn't rise above 0.01% of all the children born in those years. 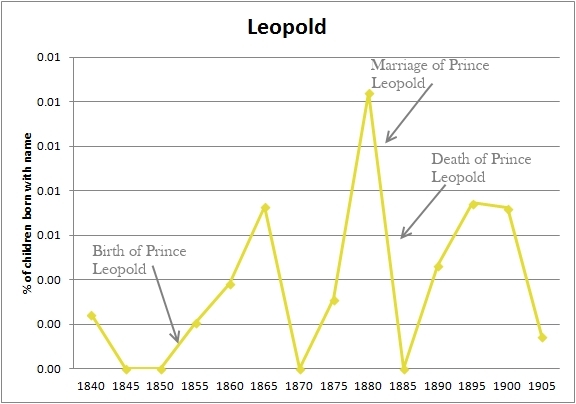 There were very few Leopolds. Like Victoria, it wasn't a traditional British royal choice (indeed, few of the names that Victoria and Albert chose were traditional royal choices) but it was a traditional choice in that it honoured Victoria's favoured maternal uncle, Leopold, King of the Belgians. Albert, better known by his regnal name, Edward VII, was Victoria's second child and heir, born in 1841. Like Victoria, it was a traditional choice - named after his father, Prince Albert of Saxe-Coburg and Gotha. It was also a new name for the royals of Britain - though it was popular on the continent, Albert had never caught on in Britain. The growth in popularity of Albert must be due to these royal Alberts - but it is difficult to tell whether Prince Albert or his son were who was being copied. 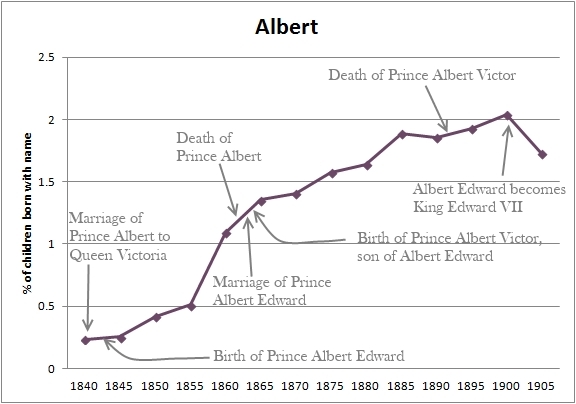 The Prince Albert Victor on the graph is the king that could have been - the eldest son of Edward VII, he died of influenza in 1892. I also missed another Albert - George VI - who was born in 1895. Alice was Queen Victoria's third child, born 1843. Her name is the most mainstream of all of Victoria's children, but it's clear that it rose in popularity throughout Alice's life and decreased following her death. In this case, it is clear that Alice was a trendsetting choice. Lord Melbourne, Victoria's first and favoured Prime Minister, liked the name and recommended it to the Queen. He had only had one son, and so had been unable to use it himself. 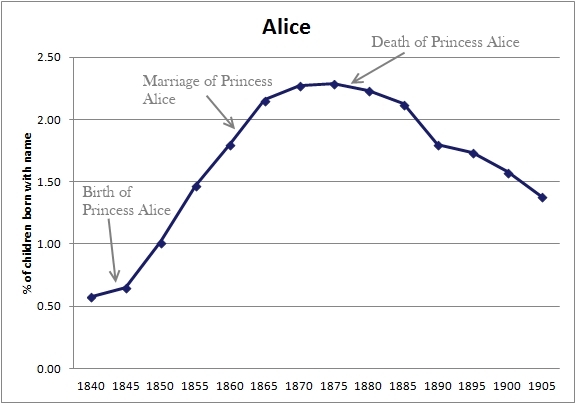 Alice was not a royal name - it doesn't seem to have been used by British royals and barely on the continent (Alix of France, daughter of Eleanor of Aquitaine and Louis VII of France is the closest I can find). But unlike Albert or Victoria, it was a name that had been used steadily in Britain since the Norman Conquest - it's the most popular name in Henry III's Fine Rolls and was in the top 10 in the 16th and 17th Century. Alfred was Victoria's fourth child, born 1844 and Arthur was her seventh child, born 1850. With two of her younger sons, Victoria chose the names borne by two great kings - Alfred the Great and King Arthur. However, it may be more complicated than that. The early medieval period received a great revival in interest during the Victorian period, so Victoria and Albert may have been reflecting that sentiment. But there were also a great Arthur and a great Alfred who may have inspired them. Arthur, Duke of Wellington, was of Anglo-Irish stock. He bore his given name well - as the general who defeated Napoleon at Waterloo and then as Prime Minister, he was both a military and political leader. Following his death, in 1852, he was given a state funeral. 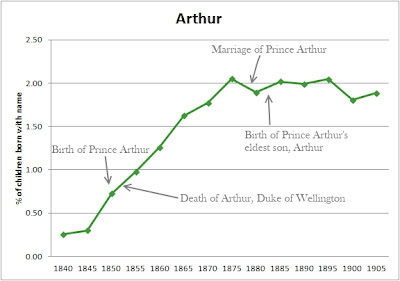 Arthur was rising in popularity before Victoria and Albert chose it for their son - the Duke of Wellington was a popular namesake. 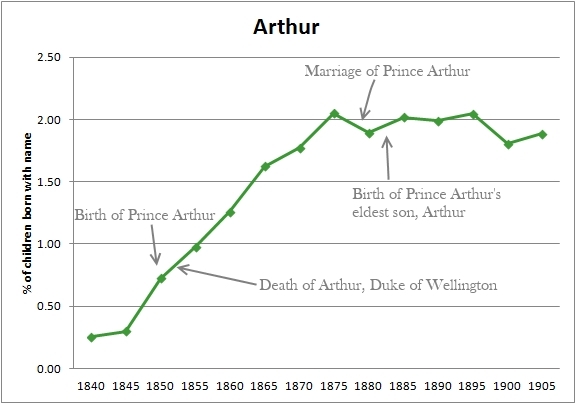 Arthur did have a background as a British royal name - aside from the mythological king, there was Henry VII's son and heir, Prince Arthur and Arthur of Brittany, heir of Richard I until his imprisonment and death by Richard's brother, King John. I think, however, that the Wellington link was much stronger than the royal link. Victoria and Albert had already shown a willingness to break away from the traditional stock of names, perhaps part of a concerted effort to distance the Queen from her disreputable predecessors. Alfred, similarly, may have been named after another great Victorian - Lord Tennyson. I am less certain about this link - Tennyson was born in 1809, and by the 1830s and 1840s had published several popular verses. Queen Victoria is known to have derived comfort from In Memoriam A. H. H., which was not completed until 1849. Most of Tennyson's great milestones (Poet Laureate, Charge of the Light Brigade, baronetcy and Idylls of the King - about King Arthur) all occurred following the birth of Prince Alfred. But Tennyson had already made a name for himself and he could have influenced Victoria's choice. 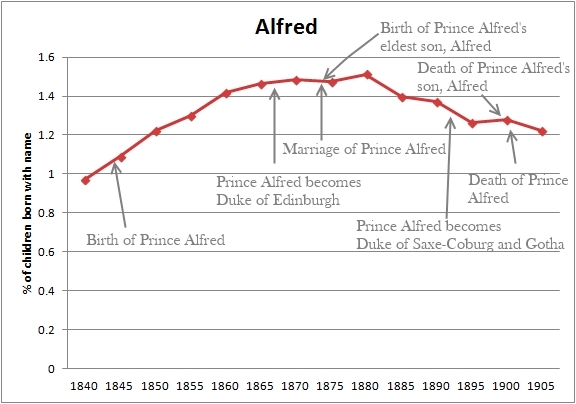 And, beyond Victoria, the growth of popularity of Alfred throughout the period could be linked more closely to Tennyson than the Prince. What's the difference between a trailblazer and a trendsetter? In the case of these two names, Victoria and Albert chose names that were barely used in Britain and consequently grew in popularity. 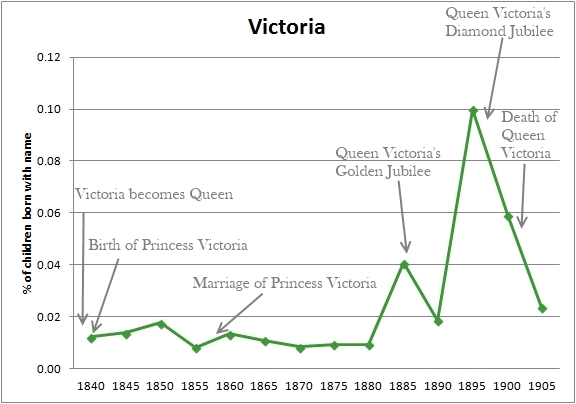 With trendsetters, Victoria and Albert seem to have added to the popularity of names that were already rising. As trailblazers, their choices brought these names to the attention of the wider public. Helena was the fifth child of Victoria and Albert, born in 1846. One of her godmothers was Helene, Duchess of Orléans. Helena was another German import, it had never been very popular in Britain and had no royal precedent. It is, however, related to Eleanor - a name with strong medieval royal connotations, born by three English queens (of Aquitaine, of Provence and of Castile). However, there was no real precedent for Victoria and Albert choosing Helena - by doing so, they were trailblazers. Beatrice was the ninth child of Victoria and Albert, born in 1857. With her name, it seems that they took an obscure name and launched it into public consciousness. It might be that simple. But Beatrice was also a name that was central to the work of the pre-Raphaelite artist and poet Dante Gabriel Rossetti. He had translated Dante Alighieri's La Vita Nuova in the 1840s, a collection of courtly love poetry between expressing Dante's love for Beatrice Portinari, and later produced paintings of Beatrice from Dante's Divine Comedy. Though Rossetti was Dante's most prominent advocate in the mid-Victorian period, Dante's work was also inspiring other artists, poets and musicians. Victoria and Albert may have been following a general trend. It is difficult to pull apart the two. 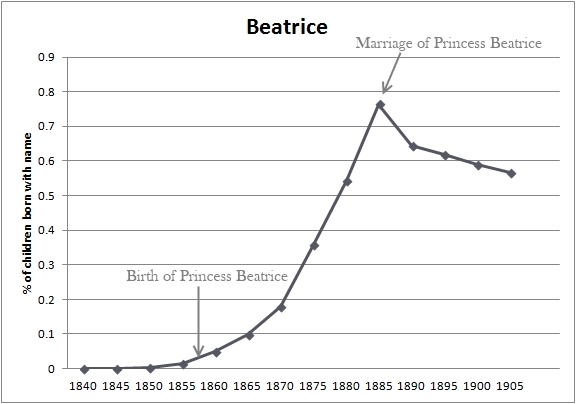 However, it is notable that while Beatrice had been used as a royal name in Spain and Portugal (and briefly in England), it wasn't a German royal name. As with Arthur and Alfred, Victoria and Albert bought into the medieval revival of the period and popularised a previously overlooked name. My data was gathered in the same method as my Victorian Smiths study, using FreeBMD to find out how many people with NAME X Smith (eg Victoria Smith) were born every five years from 1840 to 1910. In a new development for me, I then worked out how many Smiths in total were born for each five year period. From this, I worked out the percentage of, for example, Victorias born for each period. For example, 5 Victoria Smiths were born in Jan 1840-Dec 1844, out of 40783 Smiths total for that period, so 0.01% of children were named Victoria. In the case of Victoria, Helena, Louise and Leopold, the numbers of children born with those names were very small. Please look at the scales at the side of the graphs. It's a somewhat convoluted title, but it touches upon two areas that I have been thinking about since my last post on workhouse names. First, can regionality be seen in the names given in the 1881 census, and secondly, can you see if names skew 'older' or 'younger'. In 1881, was Jane a name associated with old people or young people? I'm going to address regionality first. With modern data, it can be easy to compare naming trends in different countries, and now, there is more information within countries about modern regional naming patterns. Baby Name Wizard has the excellent Name Mapper for US data, there used to be a good Baby Name Map but it doesn't seem to be online anymore. England and Wales now releases top 10s for each region; in Canada and Australia, the different states/territories/provinces release their own name data each year. The 1881 census recorded where people lived and where they were born, so it's possible to take a snapshot of which names were much more popular in certain regions than others. Some regions retain strong identities and names that are strongly linked with those regions - I've started with Cornwall. You can buy whole books about 'Cornish Names' - I wanted to find out whether any of those names was actually being used in Cornwall in 1881. I chose St Ives, and ordered the names from this page. It gave me 1615 names in total, 897 females and 718 males. There's plenty in these lists to discuss, so I'm dividing these posts into male and female to do so. I'll start with the percentage data. 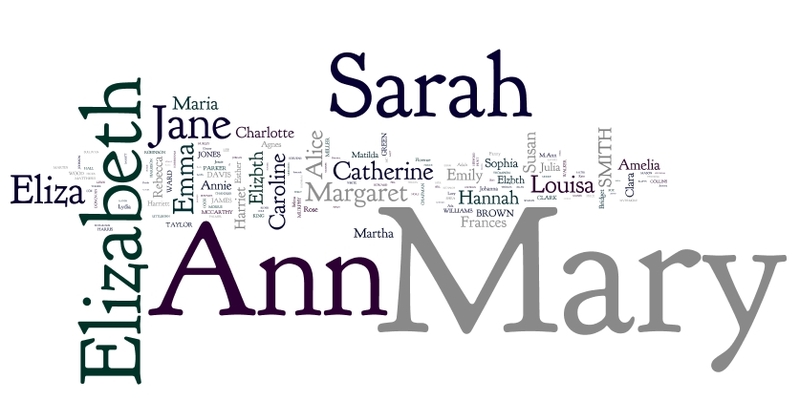 73.36% of the women in the St Ives sample held a name in the top 20, this is a little higher than the national average of 67.9%, but not as high as 78.8% of last week's workhouse names. 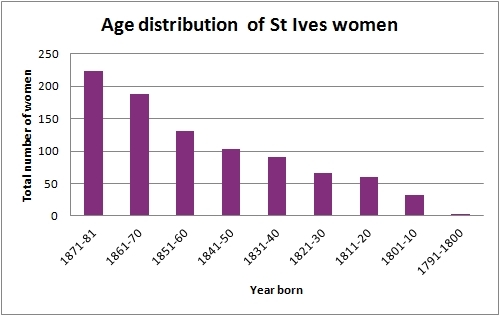 So the women in St Ives were a little more uniform in their naming habits than the general population. The top 10 in St Ives is 59.4%, higher than the general population's 53%. Regionality is clear in this list. Aside from the top few names, there are seven new names to the top 20 compared with the general population, including two (Nanny and Wilmot) which were not in the top 100 at all. Now this is a small sample, so I did consider whether Nanny and Wilmot in particular represented a family naming pattern. The same surnames were repeated frequently - it seems to have been a close knit community. However, they were from families with different surnames, and spanned ages from 67 to 4 for Wilmot and 75 to 2 for Nanny, with them fairly well distributed among the ages. Looking at the FreeBMD records, Wilmot (a diminutive of William, could be borne by men or women) was given to 1607 people (no distinction between men and women) between 1837 and 1960 (though I think the records are patchy after about 1920). Of those 1607 people, 294 were born in Cornwall - 18.2% of Wilmots. In an average year (1850), Cornwall counted for 2.2% of the births recorded on FreeBMD, so 18.2% is a massive increase. I suspect that Wilmot as a female name (as it appears exclusively in St Ives) would give an even higher %, but FreeBMD doesn't differentiate between male and female records. 1109 Nannys were born in Cornwall, 28.4% of the Nannys born in Britain. Nancy and Annie also show considerable increases. Nans is a Cornish word that means 'valley', but I don't think there's a link between the names and the word. The Oxford English Dictionary first lists Nanny appearing with its nursemaid meaning at the end of the 18th century, nanny-goat appears in the mid 18th century. Nearly half (411) of the women were under 20 years old (born after 1861), so 'young' names should dominate. From my Victorian Smiths posts, I've identified four names to test: Jane (which should be on 40+ year olds), Mary (should be on all ages, but mainly 20 year olds), Annie (which should be on 0 year olds) and Grace (which I didn't look at when I did my Victorian Smiths study - as you can see by its climb of 44 places, it's not that common among the general population). 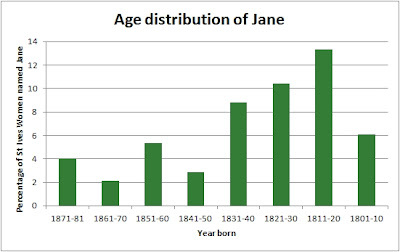 I'm going to consider the names according to the percentage of each age group they represent, Jane is a good example of how this works. There's a definite shift towards Janes on the older side. 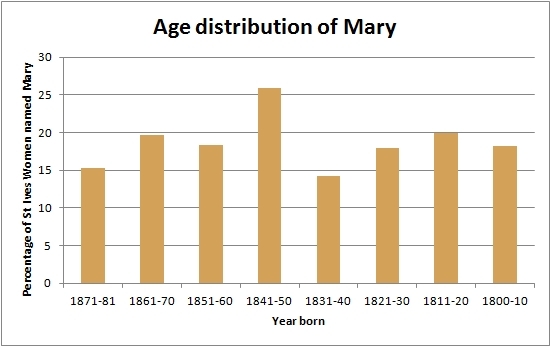 Mary is fairly evenly distributed across the ages, although 30-40 year olds have the most Marys (over a quarter of them were named Mary), with 40-50 year olds and 0-10 year olds having less. 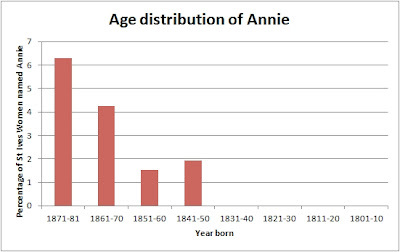 Annie is only borne by the young, most commonly those under 10. 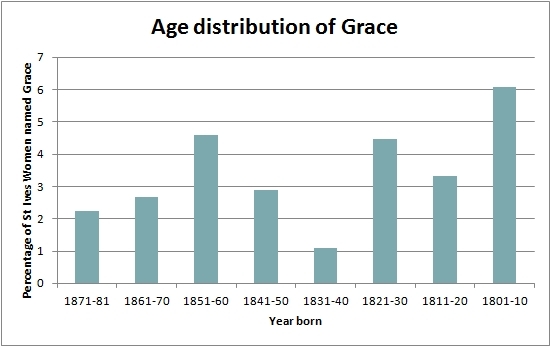 Grace seems fairly evenly distributed among the ages, but skews a little older. I'm glad that these graphs seem to have correlated with my Victorian Smiths data. I'm going to make some more, and see if any surprises come up, which I will post. And as a small conclusion (and because I could post these graphs forever), the top 10. The top 10 seems to be becoming less representative of the names borne by the younger generations. Following my post on Names and Status in the 1881 census, I've been thinking about how else status can easily be seen in the 1881 census. In my previous post, I looked at 'masters' and 'servants', and how that situation implies higher and lower status. When one speaks of 'low status', you couldn't get much lower in Victorian Britain than the workhouse. Workhouses were places where people who could not support themselves could live and have employment. Whilst they provided relief for the poor, life inside workhouses was intended to be harsh - you had to be destitute and desperate. This provided me with 4011 records,which can be broken down into 2002 men and 2009 women, a fairly even split, although I think some of the records have the wrong gender assigned (eg a female Thomas Collins and a male Rebecca Stockley). I ended up with 1994 male and 1994 female named people (some did not have a name recorded). As I was able to copy the tables, this is a study that could be easily expanded or replicated - but I stopped with 4011 as that is a workable amount to count the names. 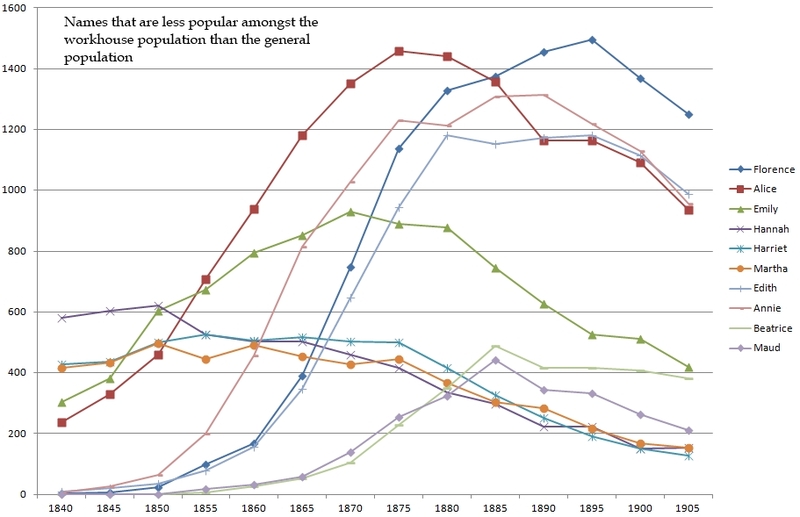 I worked out the order of the names, the % of the total who bore that name and then have compared them with 1881 census data for the general population. This top 20 is fairly concordant this is with the 1881 general population census data. Apart from a little swapping around, and Benjamin and Daniel being much more popular at #15 and #16, there isn't much of a difference. The most notable difference is that this top 20 counts for a larger percentage of the names used than the general population census data. (89.67% of workhouse males had names in this top 20 compared with 80.4% of the general population having a top 20 name). The majority of the population is low status (that's generally how status works) and as the general population census data reflects the names popular among the majority, it reflects the names that are popular among those of 'low status', diluted slightly by names that might have a strong regional identity (such as Malcolm, popular in Scotland - I think a great further study would look at names that show strong regionality). The male name that seemed more 'high status' in my previous study - Frederick - is in about the same position as in the general population here. James and George, which were more 'low status' are in about the same position as the general population as well. In general then, the names borne by males in the workhouses seem to reflect the names that were popular among the general population. A quick word on Benjamin and Daniel, as they are the two names that do show a significant increase in popularity from the 1881 census data. 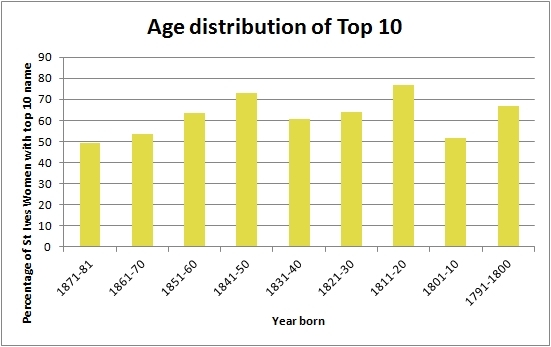 Benjamin covers most ages (there are no 20-30 year old Benjamins, but there are 10 year olds and 60 year olds), all the workhouses and are mostly born in and around London. Daniel however, is borne almost exclusively by 40+ year olds and includes five men whose birthplace is listed as Ireland. It is the second most popular name (after John) of men whose birthplace is listed as Ireland, so that might account for its increased popularity - that a significant number of men born in Ireland ended up in east London in 1880s. While the top 7 is fairly concordant with the general population top 7, the rest of the top 20 is full of movement. Some names have risen dramatically (Catherine, Caroline, Susan, Frances), others have dropped into obscurity (Annie has dropped 16 places to #25, Edith is #19 in the general population but only has one workhouse bearer). Again, as with the male names, this top 20 accounts for a larger % of the names borne than the general population - 79% compared with 68% (and note, as almost always, this shows there is more variety in female names than male names). A note on Margaret. In my previous 1881 post, I found that Margaret was more likely to be borne by the higher status individuals ('masters') than the lower status ones ('servants'). However, this study shows that it was borne by more workhouse inmates than among the general population. I wondered if this was a regionality thing - that more London-born people were named Margaret, but as many of the workhouse Margarets were born in Ireland, then this seems less likely. Most of the Catherines, Susans, Carolines and Frances are 40+, indeed, much of the workhouse population is 40+, as workhouses became places where the destitute elderly who could not work to support themselves could end up. My Victorian Smiths studies showed that all these names peaked in the 1840-50s (and probably earlier, as I was not able to study beyond 1840). So they are more popular amongst the 40+ year olds than the younger inmates. Names that experienced steeper popularity curves - were less popular in 1840s and more popular around 1880 - such as Alice, Edith, Annie, Emily, Florence (#38 compared with #21 general, and would be #1 or 2 by 1900), Beatrice (no workhouse entries) and Maud (2 workhouse entries) are all less popular in the workhouse, reflecting the lower numbers of young people in the workhouse and perhaps, the fact that once in the workhouse, women were unable to produce and support large numbers of children. Mary would be the name for a first child, Elizabeth for the second but they wouldn't get to the fifth or sixth child which they could name a more unusual name such as Florence or Beatrice. Hannah, Harriet and Martha don't follow this general trend, but only Martha is significantly less popular amongst the workhouse population.